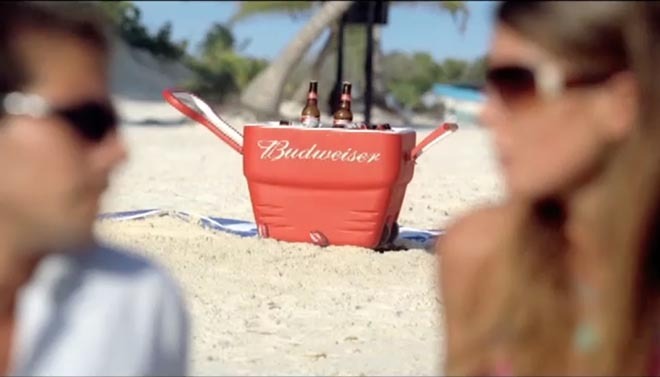 Budweiser includes a TV ad featuring beer-thieving king crabs in this year’s Super Bowl advertising campaign. 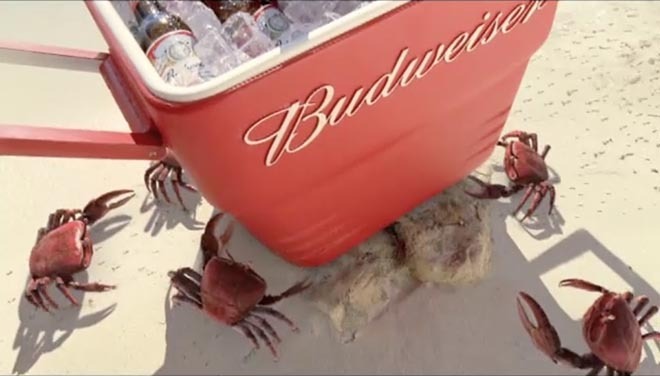 The animated king crabs turn up on a beach, stealing away a cooler full of Budweiser beer for the purposes of worship. The tagline: “Budweiser – the King of Beers”. 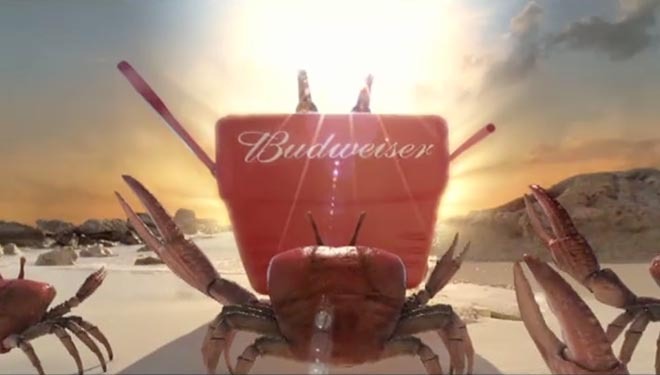 The Budweiser King Crabs spot is part of a campaign developed for Anheuser-Busch at DDB Chicago by managing director/creative Paul Tilley, group creative director/copywriter Barry Burdiak, creative director/art director John Hayes, copywriter Patrick Knoll and executive producer Brian Smego. Filming was directed by David McNally via Villains, Los Angeles, with director of photography Newton Thomas Sigel, producer Greg Ferguson and executive producer Nancy Osborne. Sound and music were designed at Elias Arts. Audio was mixed by Loren Silber at Lime, Santa Monica. Visual effects were developed at The Mill, New York, by VFX Producers Jo Arghiris and Alicia Powers, VFX Supervisors David Parker and Douglas Luke, Lead Flame Artist Westley Sarokin, Assistant Flame Artists Dirk Greene, Richard de Carteret, Mark French, Asst Combustion team Winston Lee, Anu Nagaraj, Ross Goldstein, James Corden, Jeanette Williford, Greg Gilpatrick, Smoke Artists Tristian Wake and Jeff Robins, Support artists Mary Casey and Gigi Ng, CG Lead Animator Ben Smith, CG Producer Camila De Biaggi, CG Artists Josh Merck, Emily Merger, Oscar Gonzalez, Yann Mabille, Douglas Luka and Domel Libid, andTelecine Artist (DCP) Damien Van Der Cruyssen. Animatronics were provided by Stan Winston Studio.